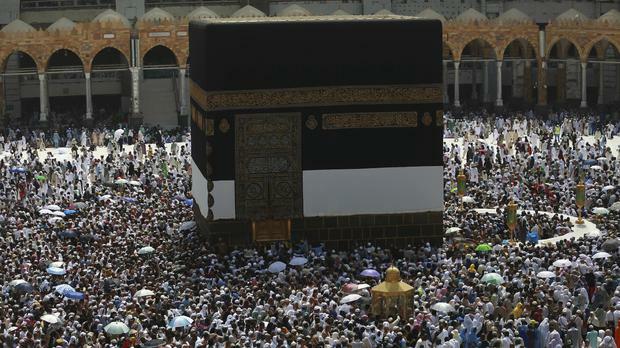 More than 1.7 million pilgrims are descending on Mecca in Saudi Arabia to mark the start of the Hajj pilgrimage. Many begin by circling the cube-shaped Kaaba - Islam's holiest site - and performing a series of rites that trace the footsteps of the Prophet Mohammed. The Kaaba represents the metaphorical house of God and the oneness of God in Islam. The Hajj is required of all Muslims once in a lifetime. The physically demanding journey tests pilgrims' patience as they withstand long waits and thick crowds on their path to achieving spiritual purification and repentance. "It's an indescribable feeling, a spiritual feeling. Thanks to God, I feel great," he said. A 104-year-old Indonesian woman is among those performing the Hajj this year, according to Saudi authorities. Ibu Mariah Marghani Mohammed is joining more than 220,000 pilgrims from Indonesia, the world's most populous Muslim country. The journey of the five-day-long pilgrimage begins for many when they depart from their countries dressed in "ihram". For men, that entails wearing only terrycloth, seamless white garments meant to represent unity among Muslims and equality before God. After prayers in Mecca, pilgrims will head to an area called Mount Arafat on Thursday where the Prophet Mohammed delivered his final sermon. Saudi Interior Ministry spokesman Major General Mansour al-Turki told reporters in a news conference that a more than 100,000-strong security force is on the ground in and around Mecca to secure the Hajj and assist pilgrims. He said the number of pilgrims at the hajj, including those from within Saudi Arabia, could reach two million. "Everything is prepared," he said. "We have our plans, we have people trained to enforce those plans, but this cannot be done only by infrastructure and by what we do. "Pilgrims have their own responsibility, and we hope they comply with the schedule plans and the flow of direction." Bangladeshi pilgrim Mohammed Nasser, 53, said the Grand Mosque housing the Kaaba is congested and busy, but believes overall the Saudi government has managed the crowds well so far. "Thank God it is going very nice and smooth. I'm very happy that I'm here," he said.